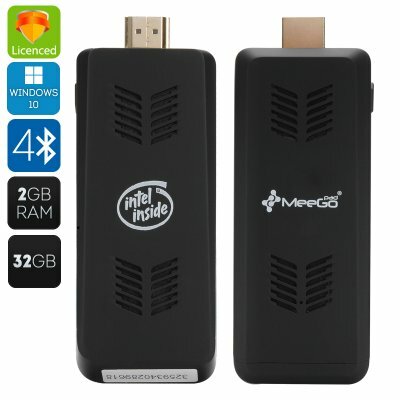 Successfully Added MeeGoPad T07 Computer Dongle - Windows 10 + Registration Key, Intel Cherry Trail CPU, Bluetooth 4.0, 2GB, Intel HD Graphics GPU to your Shopping Cart. Bring all the convenience of Windows 10 operating system to your TV or a any other screen. Have a full Windows computer ready wherever you go and benefit from the latest upgrades in the newest operating system. While there may be lots of Android TV boxed and dongles around, it’s not yet the case with Windows PC sticks. That’s why it’s always great to come by one that is powerful, efficient and sports the latest Windows 10 operating system. Simply plug the dongle into your TV, tablet or other compatible gadget and instantly turn it into a fully functional quad core computer. The dongle is well-connected and ensures easy communication with other devices. Bluetooth 4.0 and Wi-Fi are great and efficient options for wireless connectivity. With the HDMI output, you will also easily hook up the dongle directly to your TV. The mini Windows PC also features 2GB RAM for quick operation and Intel HD Graphics GEN8 GPU. This is great for all your gaming and movie watching and will let you enjoy your favorite media in great quality and with no lagging. With a powerful Intel Cherry Trail quad core CPU with burst technology, you will have all the muscle you need to multitask and more. You will have up to 32GB of internal memory to store all the needed content and will be able to increase that up to 64GB externally. The MeeGoPad T07 2GB Windows Computer Dongle comes with a 12 months warranty, brought to you by the leader in electronic devices as well as wholesale Windows computer dongles..